Future group-owned Big Bazaar has undertaken an innovative way to celebrate the Republic Day this year. This time, they have come up with ‘special supermarkets-on-wheels’ concept. Under this concept, they will offer discounted goods at the doorsteps of consumers. The company has hired 50 special trucks to execute the same. Likewise, Hab by Usha, first-of-its-kind sewing experiential store, is conducting workshop classes to embellish clothes and accessories by its swing experts on this republic day. Food retailers are too coming up with all sorts of schemes and special offers to cash in on the national festival. To celebrate Republic Day in true patriotic spirit, the Yum Yum Tree has come up with a ‘Republic Day Special Brunch’ to attract maximum customers on this day. Almost all leading e-tailers, including Flipkart, Amazon and Ebay, are offering various deals and discounts specific to this day. To begin with, Amazon.in has launched a special ‘Deals Week’ with hundreds of deals and discounts across a number of categories, including electronic, books, watches, toys and jewellery. Apart from this, the homepage has been customised by introducing tiny firkis (pinwheels) to spread out the message of unity and oneness. Viviana Mall is offering flat 50 percent off till mid-night on all brands at the mall on 25th January, 2014. Apart from the hot deals offered by the brands, the mall has also announced ‘SHOP-A-THON’, which is already commenced from 15th January. Moreover, the mall will be organising Emcee Games and special workshops for kids on this day. Last few months were not good for Indian economy; the rupee was falling drastically against dollar. In an era of economic gloom, festivals offer opportunity to bring cheer to retailers who are struggling otherwise. 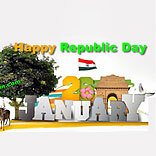 Republic Day is yet another festival for them from which retailers are looking to take leverage.